Richard L. Hilton, D.C., L.Ac. 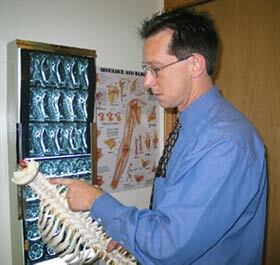 provides quality chiropractic care to patients in New Palestine and central Indiana. If you suffer from back pain, neck pain, headache, sciatica or have been in an auto collision, Hilton Chiropractic can help get you back on the road to feeling better. Our goal is to provide excellent, professional chiropractic care. Dr. Hilton has treated over 7,000 patients since opening his office in 1989 with one focus, "To help people that are in pain". Dr. Hilton loves what he does and has always wanted to elevate the status of chiropractic. It is the proven best treatment for back and neck pain. Dr. Richard Hilton is trusted by the medical profession. He was the first chiropractor in Indiana to work with the Community Hospital's Center for Integrative Medicine, Pain Management Center, and Sports Medicine and Rehabilitation Center. Call our office today at (317) 861-4300 for an appointment.